Inder Loves Folk Art: Art Museum Trousers. And yucky stuff. Everything seems to be breaking around here. My sewing machine is in the shop. Our printer isn't working. My car needed a new battery and tires. I have a head cold that seems to be getting comfortable and settling into my sinuses. Our drains need to be snaked. Again. So while my wonderfully handy husband got the cars to the shop and rented a snake and did all of the yucky dirty work, I got busy sewing. Yes, I do know how lucky I am! I needed to have a paper pattern, or at least have already printed out the pattern, because my printer isn't working. The pattern couldn't require too much top-stitching, because I'm currently sewing on a somewhat cranky older machine, and the stitches don't always turn out as hoped. Nothing in knit, for the same reason. Nothing with too many layers. Same reason. Nothing that required me to buy anything. I'm spending enough money on the car and house and sewing machine right now, thank you very much. So that's how I arrived on the Art Museum Trousers. Paper pattern, check. I have been wanting to sew this one up! Soft green easy to sew baby wale corduroy already in the stash, check. 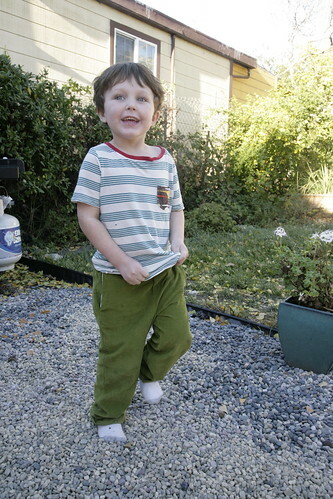 Joe's favorite colors are "blue and green" and he loves soft comfy clothes. There was only one hiccup. I've never made welt pockets before. Kind of intimidating! I considered just skipping them ... but then I decided that if anyone could teach me to make welt pockets, it would be oliver + s. Liesl's patterns are famous for their clear instructions, after all. No time like the present, right? Look Ma!! I made welt pockets! Two of them! And they look great! These look like real, grown-up trousers! I was so pleased with these pockets that I had to show them to everyone in my house - I am not sure they understood the fuss, but they were very gracious. I am pretty delighted. You know, they weren't that bad at all! The way they come together is a fun puzzle. I admit, I still don't really understand how and why they work, only that they do! (It's not noticeable, but the nap on the welts is going the wrong way - I don't understand how they work well enough to understand which way to cut the pieces!) Welt pockets are one of those things that gets you scratching your head and wondering, "who on earth came up with this idea?" It's not that difficult, but it's not intuitive, either. The Art Museum Trousers are just a super classic, wearable pair of pants. You could easily form a wardrobe around these. They really lend themselves to a more formal outfit (especially in combination with the Art Museum Vest), but they work just as well for regular ol' chinos. I am very happy to report that Joe seems to have moved past his resistance to mama-mades. I am not sure I can take much credit for that, but I am more careful to solicit Joe's input on projects these days. 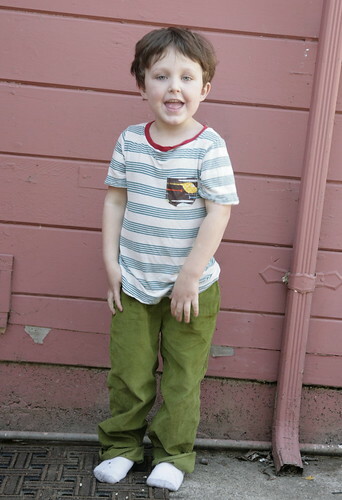 He wore an entirely mama-made outfit to the store today (well, I didn't make his socks) and then afterwards actually posed for photographs! He has a natural talent for modeling, I must say. I can't help but notice that the cut of the Art Museum Trousers is awfully similar to the many pairs of Sketchbook pants I've made for Joe, especially the flat-fronted versions. Clearly, I like this style! I know some people find sewing for boys to be a bit dull, because in the end, there just aren't that many styles to choose from. But to me, the fun is all in the details. Subtlety can be fun too. The faux fly, belt loops, and slash pockets are just perfect. These pants (in size 5) are a bit long (especially in socks). 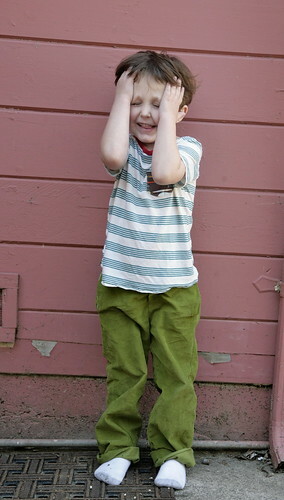 I realize that Joe is probably still a size 4T in o+s trousers, but I didn't want to buy the smaller size range when he's so close to growing out of it! So these have plenty of room to grow. Joe likes the color, the buttery soft fabric, and the pockets. This shirt started out life as a t-shirt for me, but it ended up horribly unflattering and too tight around the middle. I hate throwing away sewing projects, but I can't stand looking at them, either. 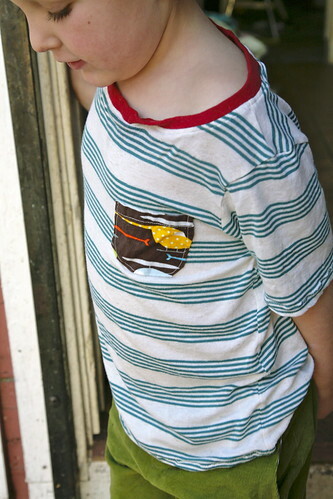 So I quickly cut this one into a t-shirt for Joe and added a little pocket in some "helicopter" fabric that Joe is enamored with. Whew! Rescued! In less than the time it took me to write this post, Steve removed our toilet and snaked the drain. The following image is not for the faint of heart ... a clump of roots in our pipes! 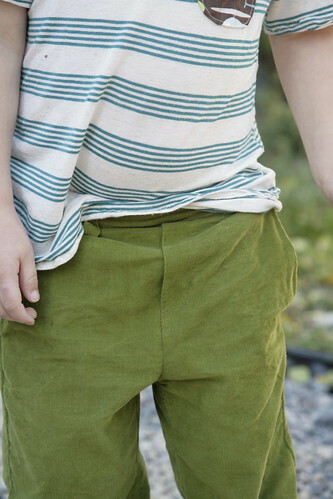 I love the welt pockets! They turned out so great! What an adorable outfit. And a very wonderful husband! Joe looks wonderful, and your hubby is awesome. I love that fabric. They will hand down to Maggie. Not sure whether I am more impressed by the welt pockets or the drain clearing! You make an awesome team :) If it makes you feel any better, we've just had to put new tyres on our car and there's a panel bit at the back being held on by really attractive gaffer tape cos we can't afford to fix it. Yucky... but things could be worse, hey. Thank you everyone! I am pretty durn pleased with those pockets, y'all. And with my husband, needless to say. Inder, these may be some of my favorite art museum trousers ever! gah! they are so cute yet look so perfectly comfy! i love them. 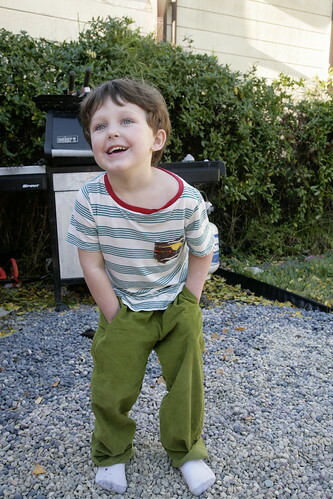 i had planned to sew a pair for Jude, i bought some (IMO) awesome fabric, but when i took his measurements, he didn't match the fit at all and it would have required a lot of altering. i just didn't feel ready for that. :/ well done, Inder, well done! Can I just say how impressed I am with those welt pockets? I bow down to you and your welt pocket prowess! And those roots? Holy sh*t!